The One Room Challenge is well underway at Flip 5! The tired & neglected sunroom is slowly coming to life. The timing of this project couldn’t be better because it will be completed just in time for summer! I can’t wait to sit back, relax with a good book, and sip iced tea in my newly remodeled sunroom. Wait, who am I kidding? I don’t get time to relax. But the thought is nice. 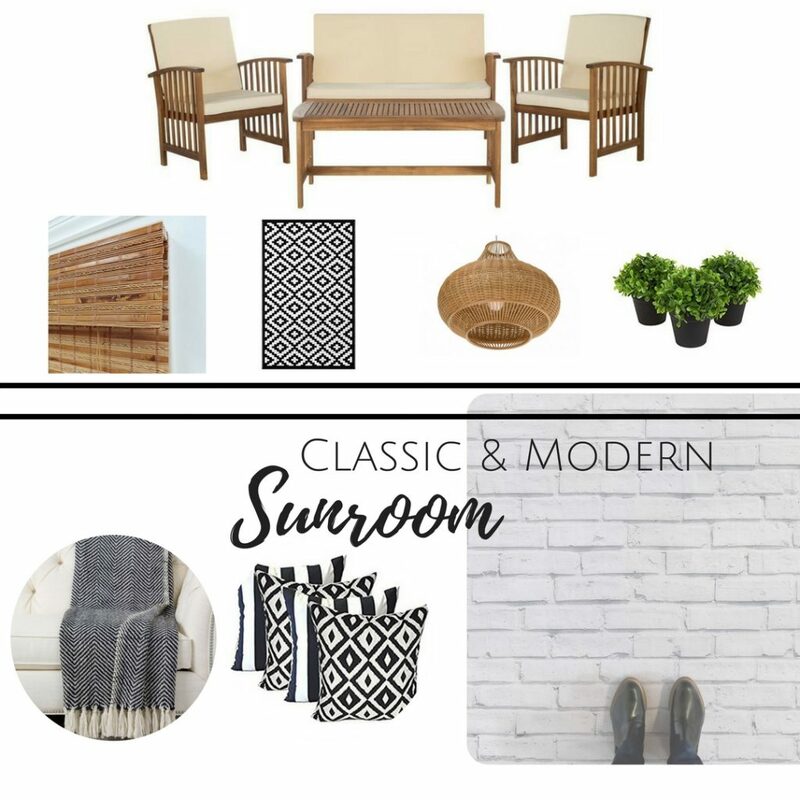 If you missed the post about what the sunroom looked like before, make sure you check out Week 1’s post. I’ve opted to go classic with black and white. I think it will withstand the test of time better than doing something trendy. In all my designs, I’ve never dabbled in black and white, and I’m really excited to try something new! I shared on Instagram this week my design board for this room. As you can see, it’s nothing dramatic, just simple and classic. My first task was removing the warped and decaying bead board on the walls. I needed to do this before the floors were done, so that everything aligned up perfectly. Removing paneling is so easy & fast (maybe not as fast as the video shows!). I will most likely replace the bead board with new bead board. They had used the particle board instead of wood paneling, and since it will be exposed to elements if the windows are open, I will most likely opt for the wood paneling and give it a fresh coat of white paint. Once I got the paneling removed, it was time to address the floor situation. I am so happy to partner with Jeffrey Court (sponsored link) on this project! Jeffrey Court generously provided the tile I chose to try in this room makeover. You can find Jeffrey Court products at Home Depot, and rather than choosing another hexagon tile like I did in the kitchen, I opted to choose something a little different. I have always loved brick floors– the warmth, the character, and the organic feel they bring to a room is why I love seeing them in houses. Don’t you? Rather than a traditional brick, I chose the white chalk brick. And to me, the pattern for laying brick tile is what makes it so stunning, so I wanted to create a design feature since I was using monochromatic tile. I chose a herringbone pattern, and I can’t tell you how much design impact it immediately brought to the room! I chose a darker pewter grout to really accentuate the pattern, and I am 100% obsessed with this floor! For the first week, I feel like I really knocked out a big portion of the project! I’m so glad the floor is done…and look amazing! But there are still several more projects to go over the next several weeks, so what is my plan for this next week? 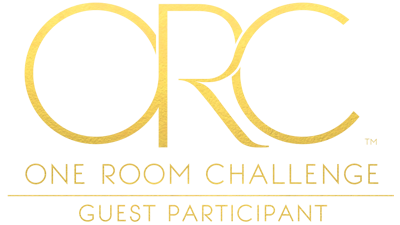 As part of the One Room Challenge with Jeffrey Court, I am competing against 15 other designers! That’s both exciting & scary! Make sure you’re following Jeffrey Court on Facebook as they will have Facebook LIVE judges discussing our designs each week! I love tile in a pattern like you chose. Much more interesting. I think you will like the black and white scheme. I just did that in my laundry to tie in with my grey appliances, white farm sink, white shaker cabinets and black hardware and Blue Pearl granite countertops. The floor is a slate look tile. The storage closet is organized in black and white herringbone storage cubes on the shelves and a small-check curtain for the open shelving below. The window curtain I made in a mid-sized buffalo plaid and a matching chair pad set for my one-chair mini mud-room space. I really like the way it looks and you should be very happy with a black and white color scheme. I am so in love with that floor, OMG it is just gorgeous. Great choice. 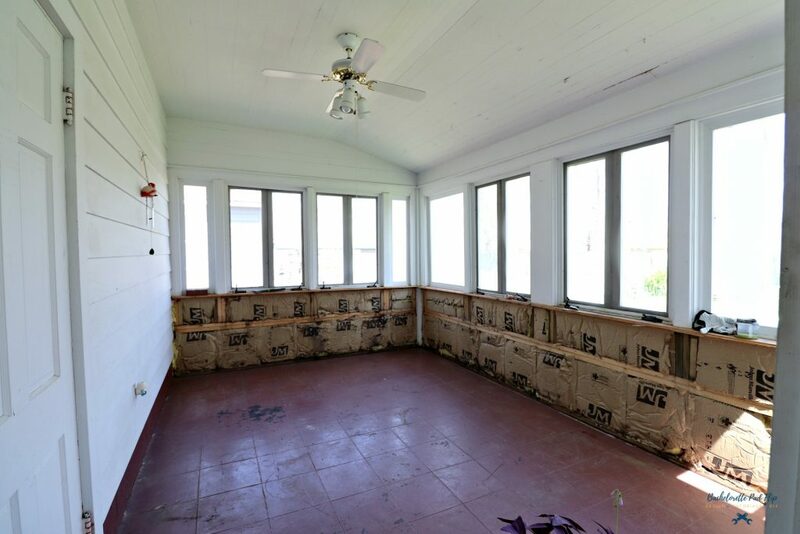 Your sun room is going to win, that floor just won it for you. Thanks, Patty! It’ll definitely be a great feature in the room! Oh my goodness I LOVE the floor!! You’re making me regret my decision not to tile my patio!!! Can’t wait to see your project come to life! Thank you! The tile is my favorite part! That tile is absolutely gorgeous! 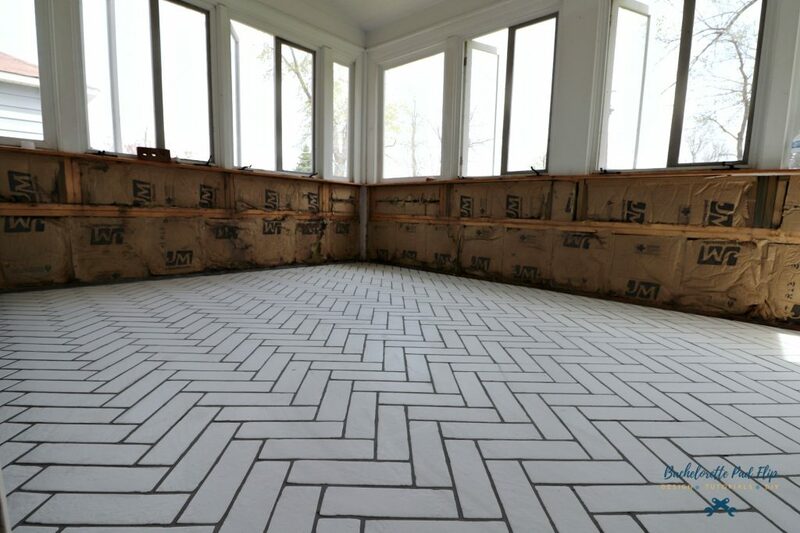 There’s just something about herringbone floors that makes me incredibly happy. Looking forward to seeing how the rest comes together. It’s my first time using herringbone…and definitely won’t be my last! Such a statement! I Love your Floor, it’s amazing….! I didn’t like herringbone until now, hows that for a Big statement…! Thanks, Penny! 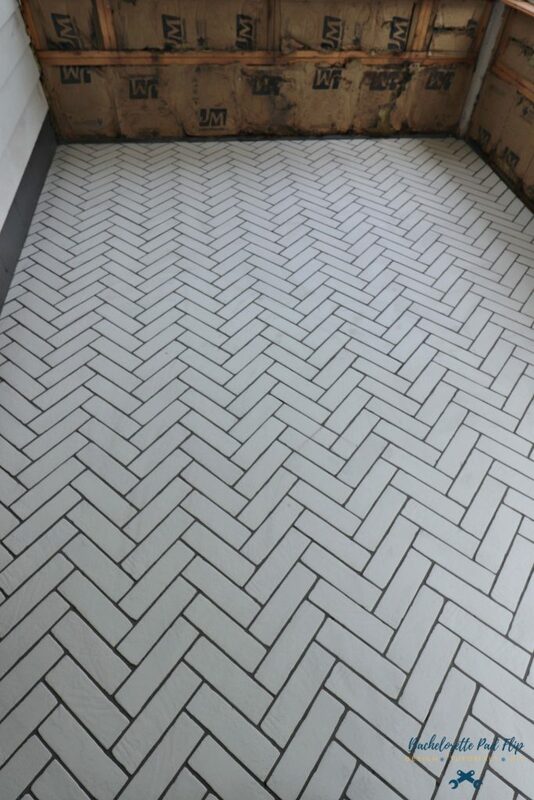 I had never done herringbone before, but this really sold me on it!